Hello lovelies! 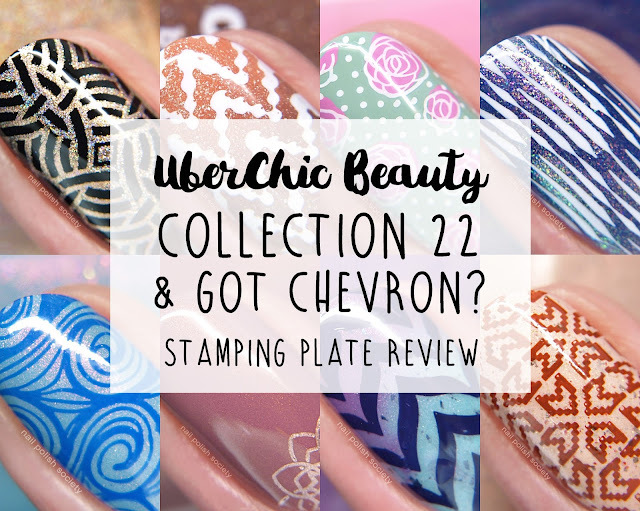 I have some UberChic Beauty stamping plates to share with you today! There were so many images I loved in Collection 22 that I had to do two from each plate. The Got Chevron plate has some pretty good images too, but I was hoping to see just a couple more traditional chevron images from it. I kept each of these looks pretty simple so they're all totally recreate-able. Hello lovelies! Here is the last April Polish Pick Up shade I have to share with you and I think I may have just saved the best for last! 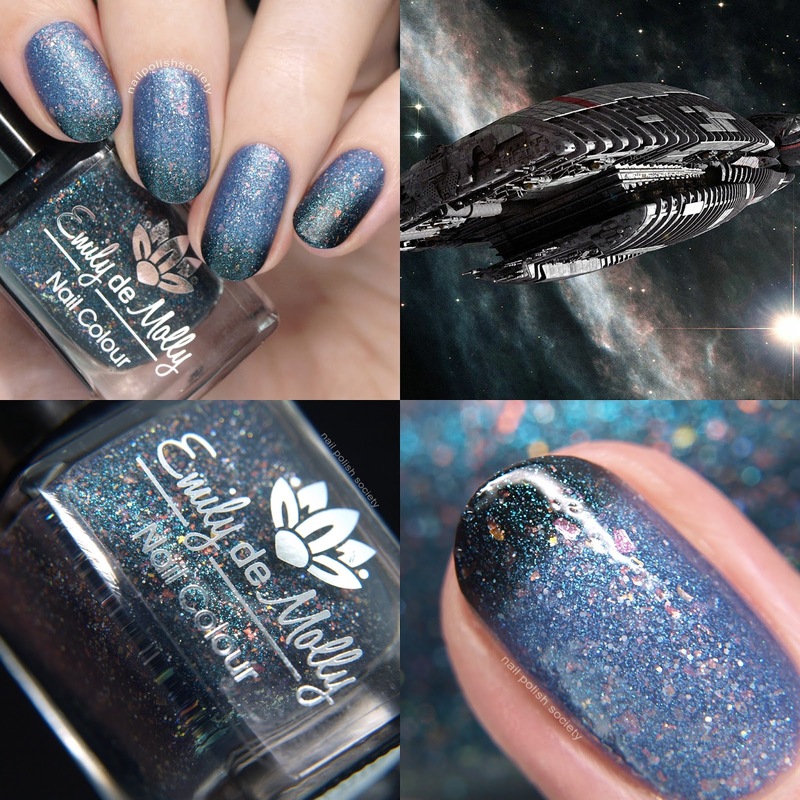 Painted Polish will be participating in the PPU for the first time and their contribution to the "Across the Universe: Planets and Galaxies" theme was inspired by the movie "Galaxy Quest". I still have never seen this movie, so maybe it's about time I do. Hello lovelies! Here I am with another shade for April's Polish Pick Up! Going along with the theme "Across the Universe: Planets and Galaxies", Carolina was inspired by this photo shown above. 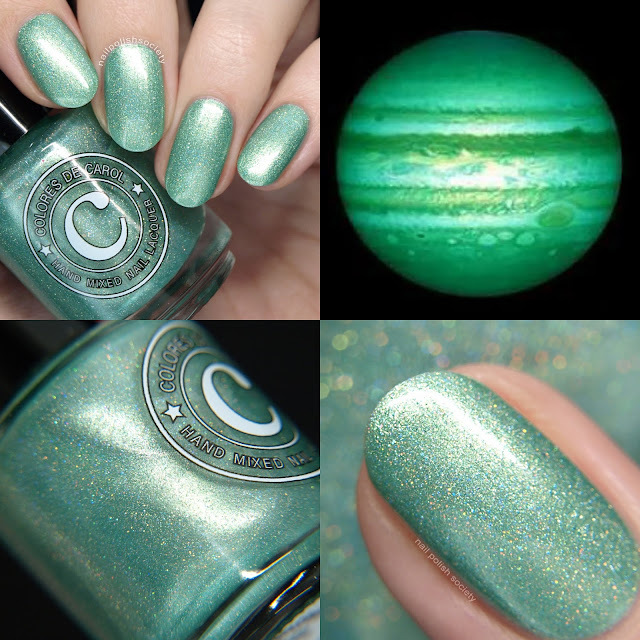 This polish may have been inspired by a distant planet, but it's totally wearable and perfect for Spring! Hello lovelies! It's been a lazy week spent inside watching the rain, wind, and lightning storms. All this wet Spring weather has put me in some kind of mood, and I've found myself reaching for polishes that reflect that with moody shades. I pulled together these four Zoya polishes that seemed to be made for each other and created some rainy day nail art. Before we get to that I wanted to show them each off individually. Hello my peeps! I have another Polish Pick Up shade to share today! I mentioned yesterday that April's theme is "Across the Universe: Planets and Galaxies" and Hayley of Emily de Molly was inspired by the above photo from Battlestar Galactica. This is a thermal polish so I have a gazillion photos showing it off! polish based on a photo it took of Jupiter, its three moons and their shadows." Holy cow, do I have a photo heavy post for you! Although there are only six polishes in the Colores de Carol Spring 2018 collection, I included MANY photos for each shade. They are all thermals so I wanted to capture the shift of colors from warm to cool, with a transition in between. I am totally captivated by this collection! The formulas were all great and each shade has a unique mixture of glitters, shimmers, and flakies. I also love how this brings be back to my childhood as I see the shades reminiscent of Hypercolor tshirts (never owned one, always wanted to). Do you see it too? Tickets can be purchased through EventBrite and a link will be listed at ThePolishConvention.com when tickets become available. Hello peeps! For those on Instagram you'll have already seen a couple of these new polishes from me, and possibly you caught my live video last night where I showed them off. If you missed it, never fear, I have all eight of the Emily de Molly March releases right here! There are so many fabulous shades this month, get ready to fall in love..
Hello lovelies! If you remember from my Launch Party post last week, KBShimmer is getting a makeover! That post was all about the gorgeous new multichrome magnetic collection. This one is back to the basics. 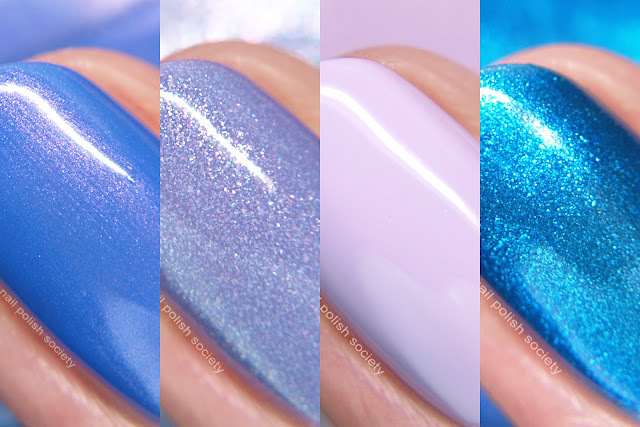 I've swatched five of the core collection polishes with their fancy new updated bottles. You may already be familiar with these shades but they're all worth a revisit! Hey hey! 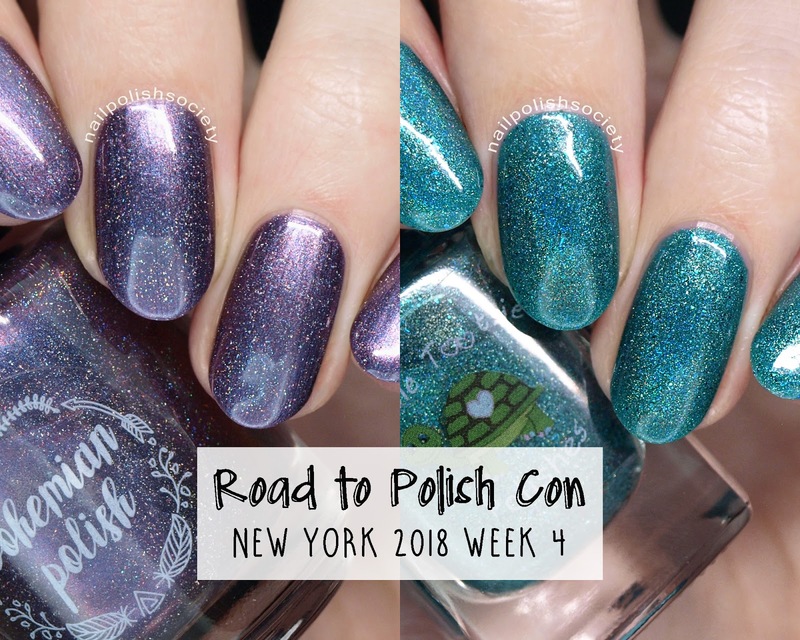 It's week three of the Road to Polish Con and I have two new-to-me brands to share this week. They both just happen to be deep vampy shades but are quite different. Let's take a look..
Fasten your seat belts and prepare for takeoff! 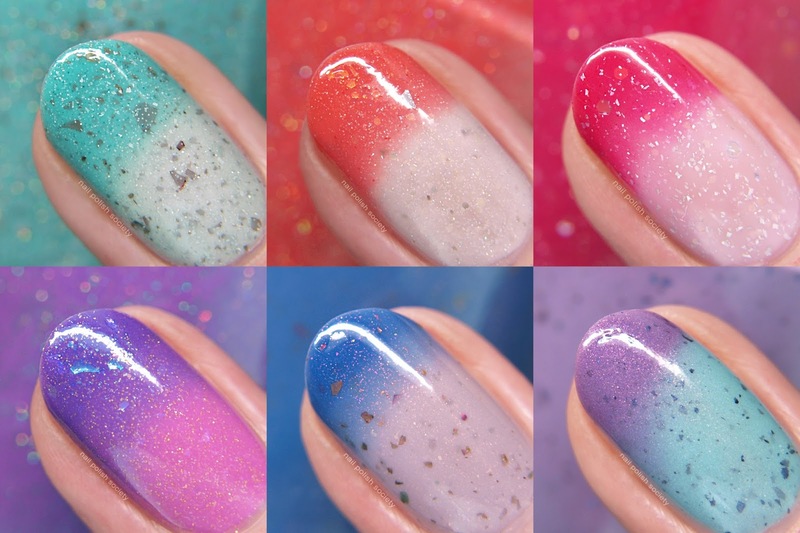 Indie brand KBShimmer is celebrating 10 years in business in a major way! They've updated their logo, packaging, and bath and body line with flare and style. 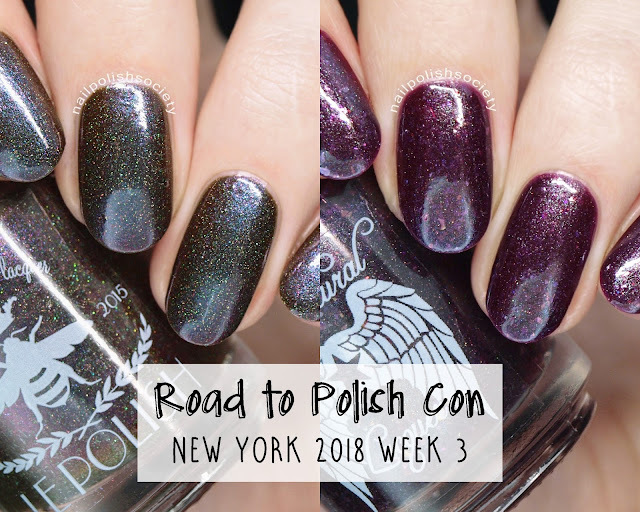 To introduce this rebranding overhaul they are releasing an eight piece duo/multichrome magnetic polish Launch Party collection, plus one holographic top coat that complements the other shades perfectly. Hey peeps! It's time for new UberChic Beauty stamping plates. Yay! You know I'm always telling myself I'm going to work on my skills with other nail art methods. But honestly it's hard to spend the time when stamping is so quick and easy. Well, it's all relative. Let's get to the new plates..
Hello lovelies! 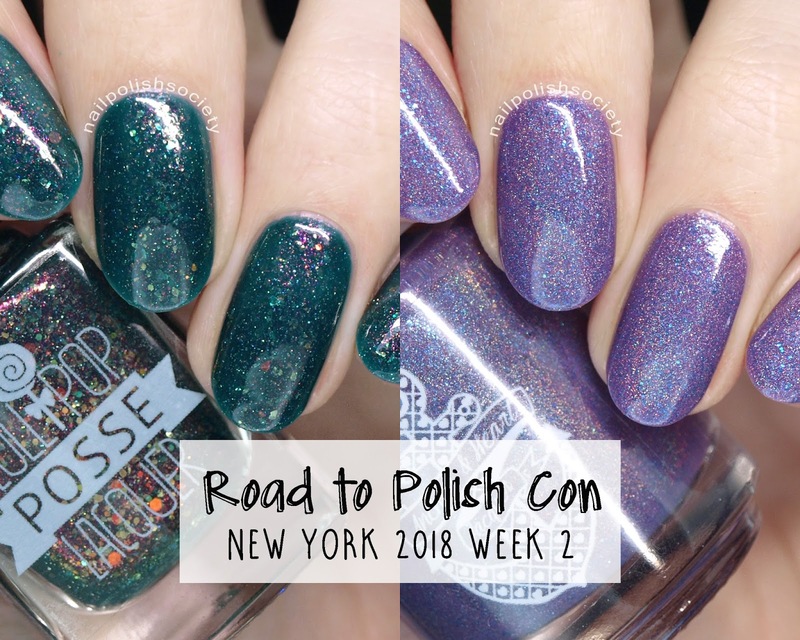 I have two stunning Road to Polish Con shades to share today! If you missed my Week 1 post you can see it here. Remember I'll be posting the Road to Polish Con series on Fridays. So make sure to come back each week so you don't miss out on any of these limited edition polishes! Hello everyone! I usually plan out the color schemes of my reviews better, but somehow every mani here turned out to be green! I think my brain was receiving subliminal messages and I just had to go with this Spring theme full on. 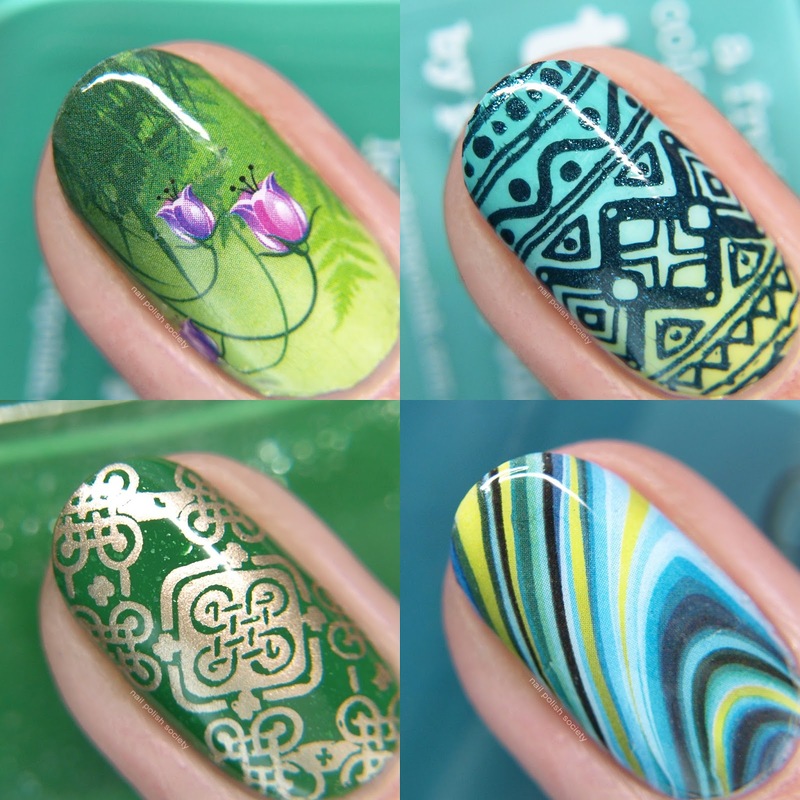 I have one stamping plate, two water decals, and a tweezer from What's Up Nails to share with you. Let's take a look..